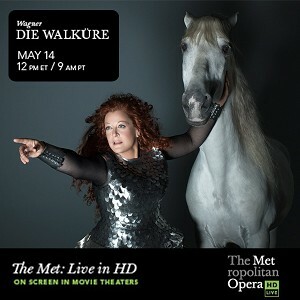 The Met’s “Die Walküre” by Richard Wagner, now showing at your local movie theatre! The two fliers were slick promos for upcoming (one now past) live HD cast performances by the Metropolitan Opera and the Los Angeles Philharmonic. GREAT ESCAPE THEATRES IS EXCITED TO BRING MORE THAN MOVIES TO OUR THEATRES! Programming for everyone, and we mean everyone – from opera, sports, and comedy to original programming feature the biggest names in radio and television – with all of it containing exclusive content you won’t find anywhere else. Special event features like behind-the-scenes footage and backstage interviews. Big screens with high-definition picture and big-time surround sound with the best seats in the house and close-up view unlike any other. For all the folks who continue to maintain the popularity of pop culture–in conjunction with the the supposed decline of high culture (Classical Music)–it’s a bit ironic that movie theaters are now showing live casts of, well, classical music. The Met has been doing this for some time now, one of my friends and wonderful bellydancer, Sara Jo Slate, had the opportunity to teach Renée Fleming some moves and do choreography for the Gala show of the Met in ’08 (Thaïs) which I had to miss for various reasons (both the live opening as well as the livecast). It was back then that the idea of live casting productions peaked my interest. Now the LA Phil is getting in on the act. With their new star power in the young Venezuelan conductor, Gustavo Dudamel, who first shook the Classical Music world when he toured the Venezuelan Orquesta Sinfónica Simón Bolívar (Simón Bolívar Youth Orchestra). Both he and the Orchestra are products of the Venezuelan, El Sistema, which has forcedsome of us to question how [little] we fund our Orchestras in the states given the wild success of the Venezuelan system. The Berlin Philharmonic has also been broadcasting its concerts live for some time now with its Digital Concert Hall though I’m not sure how that fits into Movie Theaters as I believe this is for webcasting and/or live Television.